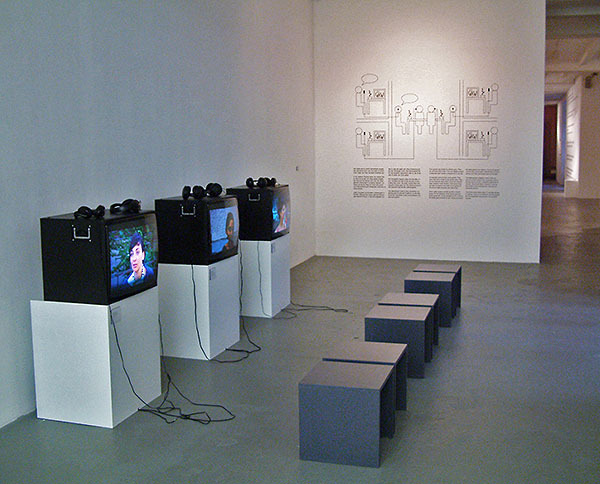 Participatory live art project and gallery installation developed in collaboration with Oliver Walker. Eight guests are invited to a dinner party; four sit at the dinner table and four sit in separate rooms. Each “table-guest” is paired up with a “booth-guest”, who tells them exactly what to say throughout the dinner (via headphone and microphone links). By means of remote communicative intervention Dinner Party investigates and problematises social interaction: the normal processes of getting to know someone are interrupted by the simple device of separating verbal and non-verbal communication. 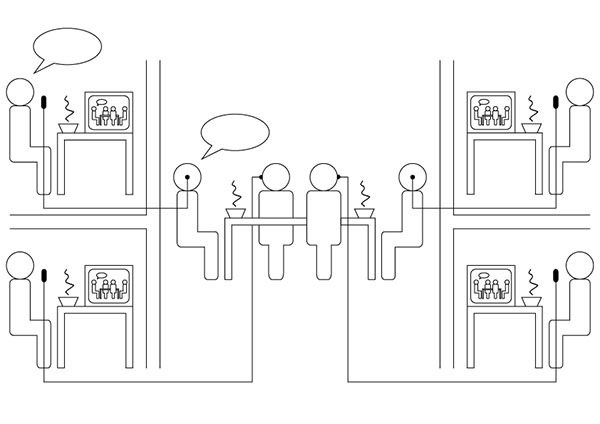 Language-based conversational content is delegated out to the “booth-guest”, whilst appearance, voice and body language is performed by the “table-guest”. The events themselves are not documented. 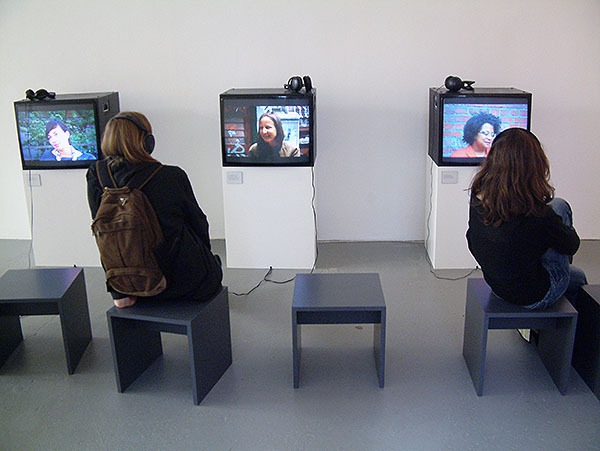 Interviews with participants are recorded afterwards to be shown as part of the gallery installation. Four guests are invited to a dinner party. They do not know each other. They are seated around a table and each wears a headphone in one ear. In separate rooms sit four more guests. They have also been invited to the dinner party. They too do not know each other. They have already been seated in their “booths”, from where they are able to observe and listen to the guests at the dinner table via audio and video links. Each “table”-guest is paired up with a “booth”-guest. For the duration of the dinner party the booth-guest will, via the headphone link, instruct the table-guest on what to say. Unless prompted, the table-guests say nothing. The booth-guests conduct the conversation authentically as themselves, as if they personally were at the table. The table-guests engage in every other aspect of a dinner party in the usual way: food is served, wine is drunk, a physical experience is shared. The conversation, however, is the responsibility of the booth-guests, who are not physically present. 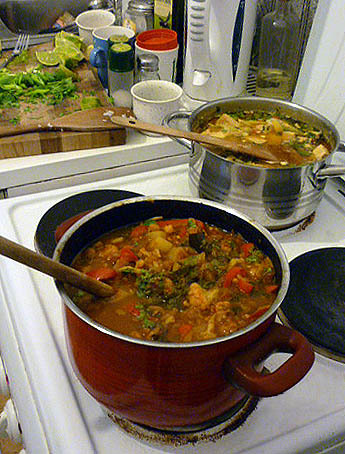 The dinner party takes place in a private domestic setting. There is no audience: only the guests and the organisers are present. Nothing is recorded. By splitting up the self in this way, Dinner Party seeks to highlight the extent to which social interaction is steered – and often unconsciously mediated – by assumptions based purely on non-linguistic factors. A person’s appearance, their physical manner, their accent or elocution, can trigger certain behaviours or attitudes on the part of a stranger. The success of the project is dependent upon both the table- and booth-guests working together to present a believable third individual: a “subject” whose age, gender, class, level of education, intelligence, ethnicity, sexuality, or political orientation remains unclear. The four individuals engage over the course of the dinner party with the familiar pursuits of making conversation, finding out about each other, judging each other, enjoying each other’s company – perhaps even finding each other attractive. They may equally find each other’s views abhorrent; for although the relaxed setting encourages natural and genuine interaction between guests, it also creates a real space for potential discomfort and rupture. The project operates as a kind of experiment: as a means of testing certain hypotheses about social behaviour within a controlled setup. But it is the guests themselves who remain in the principle position; they are not the subjects of someone else’s experiment, or the performers in someone else’s spectacle. Rather, they are active participants, it is they alone who are able to experience and evaluate the results of the situation first hand. 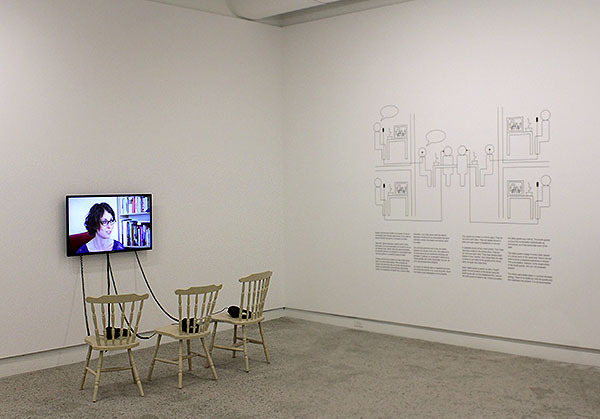 The Dinner Party live event has been realised in Berlin (2010-11), Newtown, Wales (2013) and Montreal (2015); the gallery installation has been shown in the exhibitions Making Mirrors: Of Body and Gaze, NGBK, Berlin (2011), Be Our Guest, Oriel Davies Gallery, Newtown, Wales (2013); and Polyphonies, Optica, Montreal (2015).